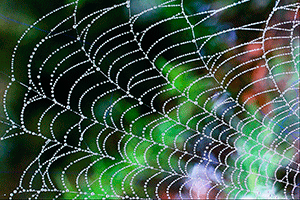 To the average person, a spider’s web looks very weak and flimsy. With the greatest of ease, a person can destroy a web. In only a second, the spider’s house is destroyed with the wave of a hand. 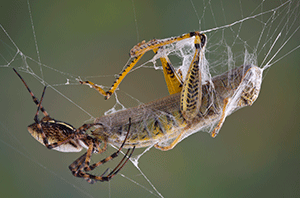 Even Job’s uninspired friend, Bildad, mentioned the weakness of webs when he compared the unrighteous to those “whose trust is a spider’s web” (Job 8:14), who are leaning upon a house that easily perishes. So why are scientists so awestruck by the spider’s silk webbing? Scientists are fascinated with spider silk because it has the amazing ability to absorb a strong impact. Think about it. Spider silk is much, much smaller and lighter than the flies and grasshoppers that often fly full speed into a spider’s web. Yet the web doesn’t break. It stretches (30% farther than the stretchiest known nylon) but it doesn’t break—at least not usually. 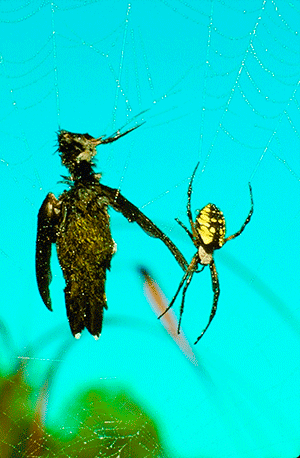 Some spiders’ webs are so strong, in fact, that they can even catch small birds, such as hummingbirds. (Yes, some spiders will even catch and eat birds.) Although it may not seem strong and tough from the vantage point of a human who easily can tear down a spider’s web, pound-for-pound, the silk from certain kinds of spiders is five times stronger than steel. Since harvesting silk from spiders is not very practical, scientists are attempting to make artificial “spider silk” that could be used for countless things, including bulletproof vests, bridge cables, and artificial tendons. How have scientists fared so far? Although they have made some progress, one scientist admitted that despite years of research, artificial webbing “can’t even come close” to equaling the amazing qualities of spider-produced silk. Sadly, this same scientist believes that spiders just “evolved the capacity to spin silk.” Are we to believe that the mastermind behind the light, stretchy, shock-absorbing, tougher-than-steel, better-than-anything-man-made, spider webbing is mindless evolution? Absurd! Spider webbing is God’s wonder material. That is, God designed these arachnids with the amazing ability to weave wonderful webs. Truly, “the foolishness of God is wiser than men, and the weakness of God is stronger than men” (1 Corinthians 1:25). “For every house is built by someone, but He who built all things is God” (Hebrews 3:4).